Hi all! I’m Maggie from (most) everything maggie and I’m incredibly honored and excited to be guest posting with Tracy today! I can’t claim to be a world traveler, but I do know that hands down, my favorite vacation spot to-date is Kona, Hawaii. My husband and I traveled to Hawaii for our honeymoon last September. We wanted a once in a lifetime experience and really- what better way to kick off married life than lounging on a beach with a pina colada? We met with a travel agent and based on her recommendations, we decided to go to two islands – Oahu (If you’d like to hear about our stay in Oahu, please click here) and Kona, on the Big Island. After our stay on the very busy Oahu, Kona was a breath of fresh air. Don’t get me wrong - Oahu was great, but Kona was amazing. Kona is serene, quiet, unique (the island is covered in black lava!) and completely relaxing. We spent our stay in Kona at the Hilton Waikoloa - it was absolutely magnificent. It’s really not a hotel- it’s an entire resort. You could spend an entire vacation here and never set foot outside the resort grounds. Hilton Waikoloa has it’s own private beach, several fantastic pools (with poolside bars that make great pina coladas! ), a private snorkeling lagoon and 9 different restaurants, including a Chinese restaurant (it was amazing!). They even make getting around easy – you can travel by foot, boat or tram to different areas of the resort. Kona was everything we wanted Hawaii to be. We slept in, we laid poolside in the sunshine (with pina coladas! 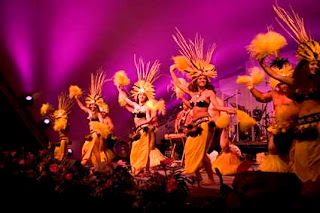 ), we relaxed on the beach and we ate traditional Hawaiian food at a beautiful luau – all without leaving our resort. 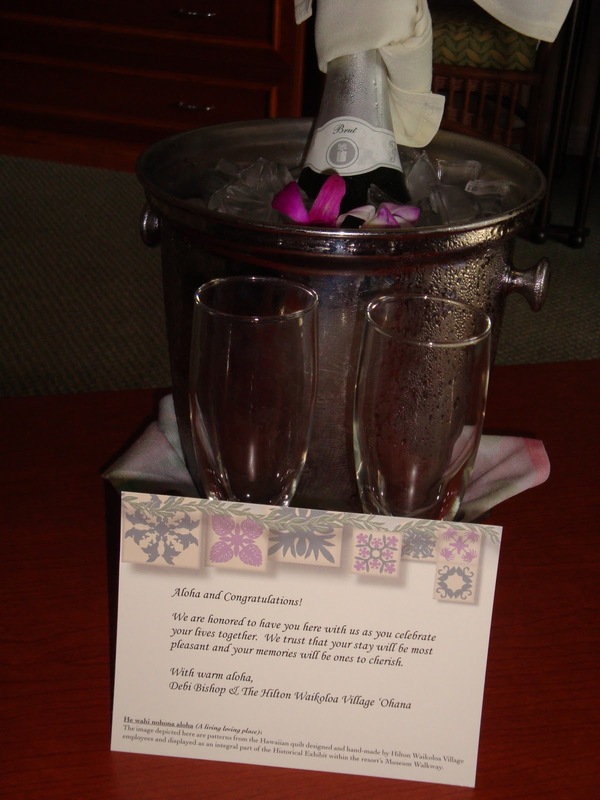 Our room was beautiful – and they gave us several perks just for being there! We enjoyed champagne in our room upon arrival, two complimentary drinks per day (pina coladas!) and daily passes to the most amazing brunch buffet I’ve ever seen. We did venture outside the resort a time or two – we took a sunset horseback ride, toured the Mountain Thunder coffee plantation and did some shopping. We weren’t disappointed – Mountain Thunder coffee was easily the best cup of java I’ve ever had, and the Hawaiian sunset is beautiful! -Don’t get caught up in all the tourist attractions – enjoy the island! -Do your research! Ask for recommendations for hotels (they all look amazing online! ), read online reviews, check out blogs for tips! -Rent a convertible (that tip came straight from my husband!). But in all honestly, renting a car turned out to be a great choice – we were able to explore the island on our own! -And if you have any questions – feel free to contact me! Now if you’ll excuse me… after all this reminiscing, I think I need to go make a pina colada! The pictures are beautiful! I would love to go there one day! In honor of our blogs recent birthday we are hosting a giveaway! Stop by and enter.